Vandalism was discovered at a bus shelter on Station Road outside the Railroad hotel in Edgware, which is home to a sizeable Jewish community. Daubed on the shelter was “Youtube this”, before numerous conspiracy video are listed including: “Talmud quotes + (about goyim)”, which when searched leads to antisemitic videos calling Judaism an ‘evil’ tradition which promotes paedophilia and that hates non-Jews. Goyim is a yiddish term for non-Jews. Other videos listed for people to search include “Rothschild Trillions quantified” and “New World Order Agenda”, which brings up antisemitic conspiracy theories, with clips about the Rothschilds banking family running the world, and controlling governments and the financial systems. 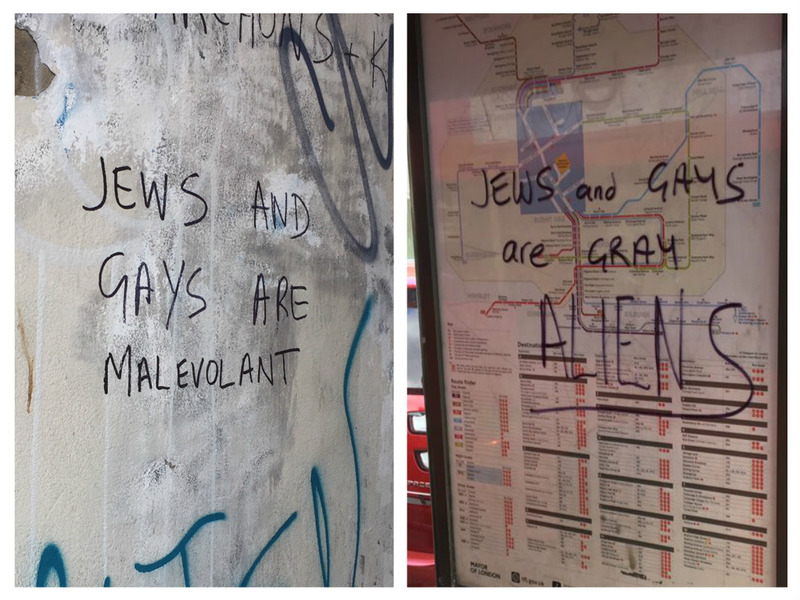 The graffiti also tells people to search about Kabalah (Jewish mysticism) as well as clips about aliens and an arrest warrant for the Queen and the Pope. By Friday morning the graffiti had been removed.